Visiting the Kala Academy is entertaining in itself. This is a large modern performing arts complex. A traditional Indian performance was taking place in another amphitheater, while the naval band was performing in the indoor auditorium. 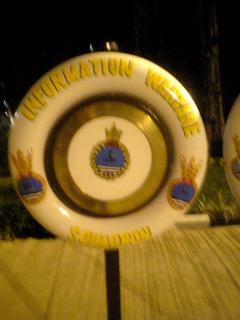 There was a line of life preservers outside with the insignia of the various naval units on them, including the Information Warfare Squadron. The Indian Navy's Information Warfare squadron ("INAS 310 "Cobras") operate Dornier Do-228 aircraft, made locally under licence, for maritime and electronic surveillance.